A Family Reading is about situations with relatives and spouses. Questions for a Family Email Tarot Reading concern connections with relatives and spouses as well as household situations. For this reading, The Fairie Tarot is used, to highlight family dynamics with particular emphasis on the influence of emotions. Click here to order a Family Email Tarot Reading. A Relationship Email Tarot Reading is about situations with partners and potential partners, as well as friends and associates. This Reading reveals insight into people’s motives and/or fears. Also, this Reading can be used to discover the potential for a new relationship. For this Reading, The Faerie Tarot is used to highlight relationship dynamics, particularly the influence of emotions. Click here to order a Relationship Email Tarot Reading. Do you have a question about where your next bit of income will come from? If so, then a Money/Career Email Tarot Reading is for you. Not only will it provide guidance for money questions, but it will also help with questions about your job or career. For instance, should you relocate, should you go for a promotion, or, maybe, should you switch jobs or start a new career. The rich imagery of The Gilded Tarot is used for these questions to provide a deeper understanding of your financial matters. Regardless of your question, I will always be here to answer it for you. 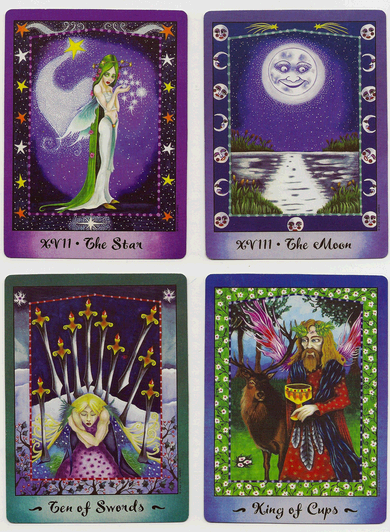 Click here to order a Money/Career Email Tarot Reading. Spirits on the other side are eager to share with us here and communicate knowledge we have yet to know. Regardless how a deeply loved one may have passed, your deceased loved one wants to hear from you and wishes to communicate with you as well. The Mystic Faerie Tarot is the deck that Selena uses to invite Spirits to share their helpful knowledge. Click here to order a Spirit Contact Email Tarot Reading. Click here to read an Interview in which Selena talks about her background, family, Spiritual Experiences and work as a Tarot Reader.